The most sacred shrine of Lord Vishnu, Badrinath is one of the Char Dhams of Uttarakhand state and also the Chardhams of India. 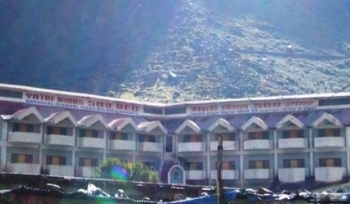 GMVN Badrinath Yatri Niwas serves budget travelers with dormitories. Badrinath is situated at an elevation of 3,133mts above sea level in Chamoli district of Uttarakhand state. The Badrinath Yatri Niwas is situated in the town of Badrinath. The GMVN Yatri Niwas provides budget priced 500 beds for pilgrims visiting Badrinath. There are dormitories for the guests at low budget with best amenities like bathroom, hot water, clean bed etc. The restaurant in GMVN Yatri Niwas Badrinath serves pure vegetarian hygenic food. The hotel is located to nearby the Badrinath temple, the nearest airport is the jolly grant in Dehradun, 10 km from the Bus stand and there is two Railway station one is in Dehradun and another is in Kathgodam Railway Station.